Documents show that the Bush and Obama administrations were intent on developing firm “military to military” ties with the Libyan regime of Col. Muammar Gadhafi. This was revealed in transcripts of diplomatic cables released by WikiLeaks on Aug. 24. In addition, Human Rights Watch has released copies of papers found in Libya’s office of External Security in Tripoli, which disclose ties between that agency and the CIA and British intelligence. Photos of the documents were given to the U.S. media. A memo sent from the U.S. embassy in Tripoli in early 2009, released by WikiLeaks, stated that the U.S. views Libya as “a strong partner on counterterrorism,” though it cautioned that “the Libyans remain wary of initiatives that put foreign military or intelligence assets too close to their borders.” Nevertheless, the documents indicate, Washington hoped to integrate Libya into AFRICOM, its military front that would rely on U.S. troops and bases in Africa. Some of the Tripoli papers open a window onto the practice of rendition, in which the U.S. sent prisoners to other countries for interrogation—including countries known for using torture. “We are eager to work with you in the questioning of the terrorist we recently rendered to your country,” Mr. Kappes wrote in the memo to Koussa, adding that he would like to send two additional agents to Libya to question the suspect directly. It must be noted that none of the released documents demonstrate that the United States had any concerns at all about violations of human rights in Gadhafi’s Libya. 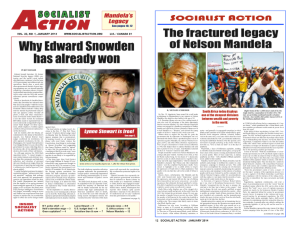 > The article above was written by Michael Schreiber, and first appeared in the September 2011 print edition of Socialist Action newspaper.